Quartz countertops are among the latest worry-free alternatives to the more high-maintenance granite. Quartz countertops require no sealing, are stronger when compared to granite countertops, are extremely resistant to stains and scratches and they also come in a wide range of colors thus making it easier for you to choose a color and design that matches your current kitchen décor. For instance, quartz countertops can be fabricated with various custom profiles that include ogees, straight edges and bevels. Usually, a quartz countertop consists of 7% natural minerals and 93% quartz thus becoming one of the hardest materials behind sapphires, topaz and diamonds. This natural hard composition is non-porous and durable and this is the main reason why a quartz countertop is extremely resistant to damage, stains, mold and bacteria. Also, quartz countertops require minimal maintenance in order to have their lifespan prolonged. Their beautiful color is a positive feature but looks are not everything when it comes to these highly resistant and functional kitchen surfaces. One of the best features provided by a quartz countertop and what makes this countertop be among the best choices when it comes to decorating your kitchen is that its surface is not porous. 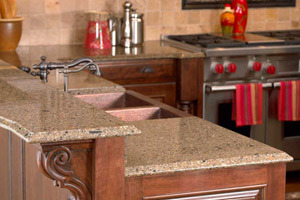 Additionally, a quartz countertop is more resistant to various stains such as wine, vinegar, coffee and lemon juice. Due to its non-porous surface, a quartz countertop will not have to be sealed on regular basis in order to keep its good looks and shine. Another benefit provided by a quartz countertop is the fact that this surface is difficult to scorch - however, you should definitely use hot pads and trivets in order to maintain its looks. In comparison to other solid natural stone surfaces, quartz is almost maintenance free  all you will have to do is to wipe this surface with some warm water in order to have it cleaned. Also, when caring for your quartz countertop, you will have to use a non-abrasive cleaner  go for hot and soapy water and use a soft washcloth in order to wipe its surface. Also, you can use quartz cleaners that are already available in the supermarkets  just make sure you avoid bleach when cleaning the quartz countertop. Even if a quartz countertop is extremely resistant to acids and chemicals, you must use coasters and hot pads as the best protective measure that will increase the lifespan of your countertop. While very hard, you must not use your quartz countertop for cutting  go for a cutting board in order to prevent any possible scratches.